The winners of the 2018 World Cup travel to the Zimbru Stadium to kickstart their qualification campaign for the upcoming European Championships, taking place in 2020. Following their monumental success at last year's World Cup, global champions France take on Moldova as they begin their quest for further glory at the 2020 European Championships. The sides have been allocated to Group H for the qualifying stage which spans a period of roughly 12 months, reaching its climax on 31 March 2020. Albania, Andorra, Iceland and Turkey make up the rest of the group. France last featured back in November with a narrow 1-0 victory over Uruguay. Starlet Kylian Mbappé suffered a shoulder injury in the first-half, but Chelsea striker Olivier Giroud scored from the spot just after the break to give his side the win in the friendly. Les Bleus had also participated in the newly founded UEFA Nations League but were pipped to a place in the finals after the Netherlands earned a dramatic late draw in Germany. Meanwhile, Moldova played much more recently than their opponents. Back in February, they were defeated 1-0 by Kazakhstan after an own-goal from debutant goalkeeper Dumitru Celeadnic. That loss marked the end of a five-game unbeaten run, however Moldova have won just two competitive games since 2013 — both of those came against San Marino last year. To the knowledge of records, this is the first time the two have ever met, both in a friendly fixture or competitive encounter. Moldova manager Alexandru Spiridon featured 16 times for his country during a playing career spent in both his homeland and Ukraine, and he admits his players are privileged to be able to take on a nation of France's standing in football. "Playing against the world champions, players like [Antoine] Griezmann or Mbappé, it's an honour for our players," he said. "We are more motivated than ever. The goal is to control our emotions in the first seconds of the game; after, we will have to play to show our qualities. "Almost every player of the Moldovan team has to play the best match of his career, with a total motivation. By sacrificing yourself, you can finish with an acceptable result. They are favourites, they must start the qualifying with a win, but let's try to do everything we can to get a positive result." Meanwhile, for Didier Deschamps, questions have been raised over whether Les Bleus will live up to expectations after their victory in the summer. Many have claimed it will be difficult to motivate the team for trips such as this after the glamour of recent success. "It's not difficult, it's obvious," Deschamps responded, bluntly. "Players are used to a different context and playing in other competitions. We have a lot of respect for Moldova. It should not be an excuse for we have already been faced with this type of situation. We do not need to adapt because it's how it is. We deal with it. "I'm not going to do a drawing; we came here to win by playing our best possible match, trying to get the most out of the game, having as many opportunities as possible, and scoring goals in particular. The Moldovan team has quality; it's never easy. We always begin with the intention to start qualifying well." Moldova have no injury concerns and, as such, are expected to field a team similar to that which featured regularly in the Nations League. However, a notable absence from the squad is FC Rostov midfielder Alexandru Gatcan — the 34-year old will need to be replaced in the centre of the pitch. Manchester United winger Anthony Martial withdrew from the French squad after suffering a knee injury. He has since been replaced by Thomas Lemar of Atletico Madrid. Both Benjamin Mendy and Lucas Hernández were not called up due to their recent fitness issues, opening the door for Lucas Digne or Layvin Kurzawa to occupy the left-back position. The world champions will have Presnel Kimpembe to turn to should first-choice centre-back Samuel Umtiti's injury struggles continue, though the Barcelona player appears to have overcome his knee problem. Moldova — Koselev; Jardan, Posmac, Epureanu, Reabciuk; Carp, Ionita; Antoniuc, Cocluc, Ginsari; Damascan. 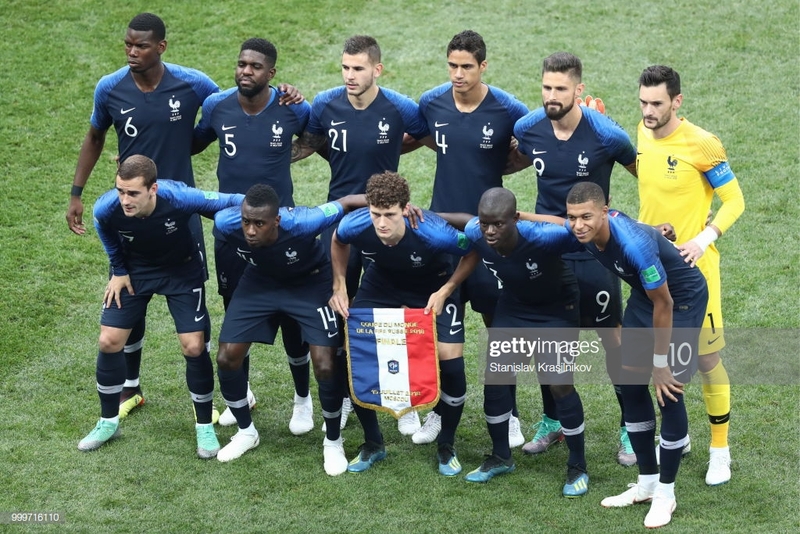 France — Lloris; Pavard, Varane, Umtiti, Digne; Kanté, Pogba; Mbappé, Griezmann, Coman; Giroud.